How much work do you think it takes to be a police sketch artist? Eons of schooling? Drawing until your fingers are just massive rods of blisters? Or, maybe you can be the guy who drew the police sketch above and just doodle out a little something-something. Well, doodle out a little something-something they did — and, on the goofiest cartoon imaginable, Hung Phoc Nguyen (seen above) was caught. 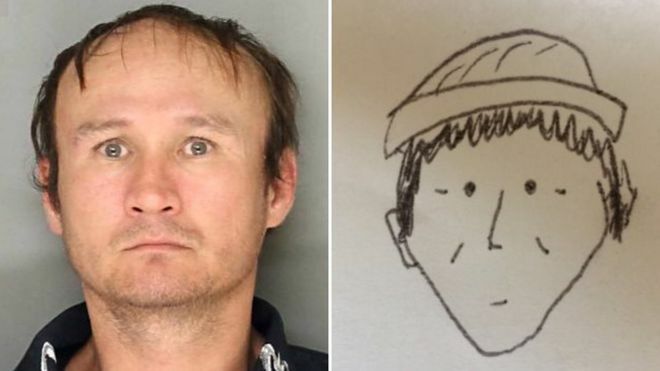 After a witness drew his own sketch of Mr. Nguyen — who was suspected of petty theft — and showed it to the Lancaster Police Department, it somehow was enough. Those weak little lines on a piece of paper were enough to jog the memory of an investigator who could identify Nguyen by that alone. Brilliant. Beautiful. We live in the wonderful world of the Simpsons Gagiverse, we live in a stupid cartoon caricature reality. Bless, bless, bless. What do you think of the dumb looking doodle that somehow got justice to be served? Let us know in the comments or on Twitter at @WhatsTrending.